You know you’re in the right journalism program when, before the semester has even started, you race to campus at 6:55 am, jump into cars with 10 strangers and drive two hours just to get a close and personal look at the largest toxic waste cleanup project in the country. And instead of being the slightest bit grumpy, you feel like you have finally found birds that share your particular brand of nerdy feather. The 2018 class of UM’s Graduate Journalism program listens closely as reclamation specialist Tom Malloy describes the future plan for the Berkeley Pit. Photo by Doug Simpson. 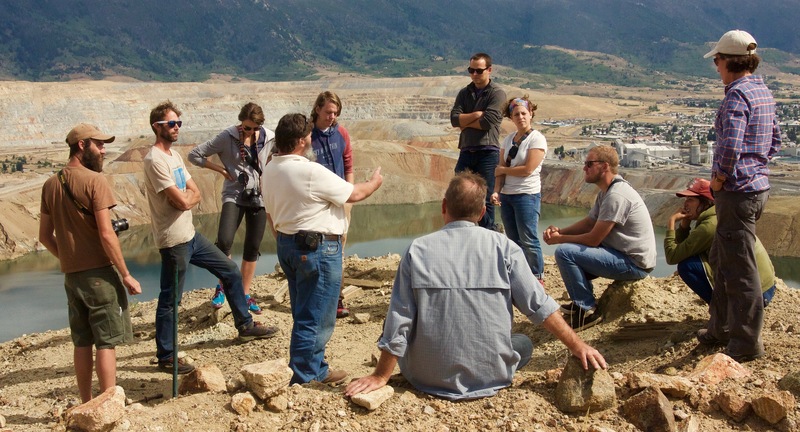 Staring into the Berkeley Pit may not be everyone’s idea of a good time, but it tends to be right up the alley of new graduate students in the University of Montana’s graduate program in Environmental Science and Natural Resource Journalism. It’s become a tradition to kick off the program with what Professor Nadia White calls the “Super Fun Superfund Tour” – a daylong immersion into Montana’s storied mining and extraction history. This year, the new cohort moved backwards through time and space, tracing the Clark Fork River upstream from Missoula toward its headwaters near the Continental Divide. The Clark Fork and its tributaries are the veins through which toxic pollutants from a century of copper mining near Butte have spread. Each mile of the river is in a different state of restoration, reclamation, stagnancy or conflict. Our first stop was Dry Cottonwood Creek ranch – a working cattle ranch owned by the non-profit Clark Fork Coalition located on the Upper Clark Fork. It’s a living laboratory for river and soil reclamation. Rancher Maggie Schmidt showed students the sections of the river that are in the process of being cleaned up and explained the impact the reclamation project is having on her ranching operation. The visit was a window into how the federal government’s Superfund program plays out with private landowners and the agriculture sector on the ground. Our caravan then wound through the town of Opportunity, which continues to be the dumping ground for other places’ hazardous waste. Brad Tyer, one of our chaperones and author of the book “Opportunity, Montana: Big Copper, Bad Water, and the Burial of an American Landscape” offered insight as to how some communities, lands, and rivers in Montana may be restored, but there is almost always another one that becomes a kind of sacrificial lamb in exchange. We stopped for lunch in Anaconda, which is famous for its remnant landmarks from its smelting days. At Smoke Stack State Park, I looked around to see my fellow graduate students clambering over a brick wall to touch slag from the old copper smelter with their bare hands. Finally, we landed in Butte, the “black heart of Montana,” to meet up with Tom Malloy, the reclamations manager for Butte-Silver Bow County. Malloy lives and breathes environmental reclamation. He knows more sneaky passageways to mining sites than just about anyone else in the county, or maybe the entire country. Malloy treated students not only to a bird’s-eye view of the Berkeley Pit, but also to a once-in-a-lifetime visit to Yankee Doodle Tailings Pond, which is hidden from the general public’s direct sight. Seeing the legacy of extraction helped some students ground their ideas about these infamous places. Tom Malloy leads students through Slag Wall Canyon outside Butte – the last stop of the Super Fun Superfund tour. Photo by Olga Kreimer. Tromping around with Malloy was like having an all-access pass to the behind-the-scenes drama of Butte. I knew he had saved the best for last when he said he was going to take us to “Slag Wall Canyon”, a first for students as well as for our chaperones. We pulled up next to a trickle of water outside of town and ducked under a crumbling archway. 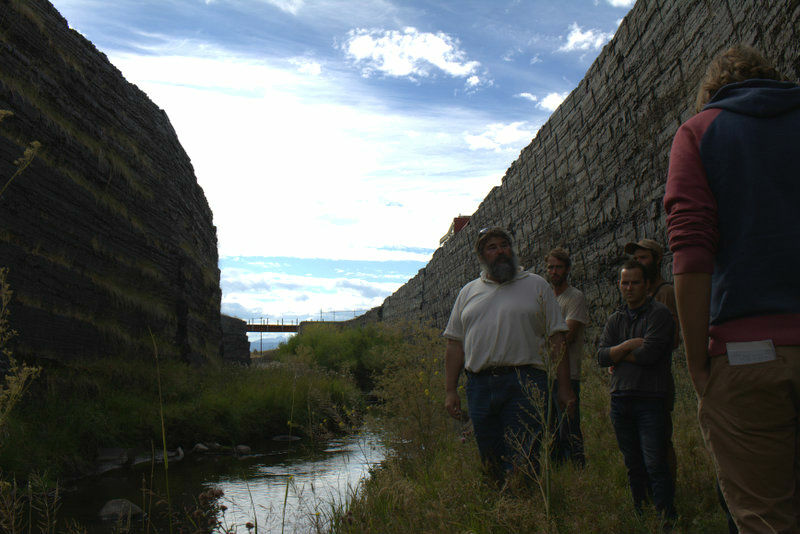 Soon, we were watching Silver Bow Creek meander between 30-foot walls constructed of bricks made from smelting waste. To the untrained eye, it was beautiful and eerie at the same time. But to Malloy, it was another environmental disaster waiting to happen. He told us that toxic tailings are buried just beneath the slag walls. Meaning that if a big flood were to occur, or the slag walls proved structurally unsound, the old chemicals would be unleashed into the creek, enter the Clark Fork and make a dash for the Columbia. All of the reclamation and healing efforts at places like Maggie’s ranch would be undone, and the water supply of this area would be severely compromised once again. As Malloy pointed out this risk, we thought hard about what it meant in the big scheme of things. As emergent journalists, how can we talk about slag walls and this one creek in a way that connects our audience to the hard and complex choices we all have to make? What about the ones we don’t make, but are implicated in? And how do we do that gracefully, without scaring the public away? For his part, Malloy advocated for the creek to be re-routed away from danger. He made it sound as if changing the path of an entire creek was a relatively quick-and-easy fix, and to a reclamations specialist, perhaps it is. But long after we arrived back in town, a little late and very hungry, I kept thinking about progress. I wondered how someone like Tom Malloy defines progress in his work on a daily basis when he is surrounded by problems created decades ago and solutions that will take a century. And how we are willing to define “solutions” themselves – when it’s so much easier to wish some of these harms had never been caused in the first place. I hope the questions that bubbled to the surface that day will stay present as we willingly and bravely enter the fray as journalists, listeners, storytellers and witnesses.